Tonight at Noon is a story of love between American opposites: she, a product of privilege, a Smith College graduate who worked as a journalist in Europe and in New York he, an authentic jazz master, a brilliant, eccentric, difficult artist, a scion of Watts, Los Angeles, who would become one of America's foremost composers. 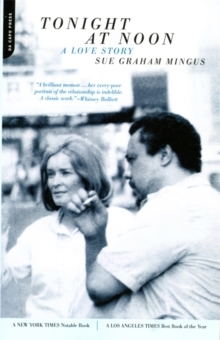 Charles Mingus's improbable love for Sue Graham, his unpredictable confrontations, excesses, and exaggerations, drew her into a bewildering world, one where jazz and art were magnificent obsessions -obsessions refracted through Mingus's individualistic interpretation of life itself. It was a world that was as hostile, enlightening, and baffling as any far-off country. In Tonight at Noon, Sue Graham tells the story of that world, of her tumultuous, passionate marriage, and of her personal odyssey inside and outside its confines. Here is a love story that is also an important chapter in jazz history, a portrait of a marriage that also sheds light on the inner workings of a rare and complex artist whose music still plays to packed concert halls almost twenty-five years after his death.